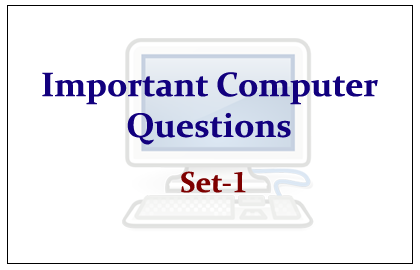 List of Important Computer Questions for upcoming IBPS/ SBI/ PO/ Clerk Exams were given below. Candidates those who are preparing for these exams can make use these questions. 2).Who developed the basic architecture of computer? 4).Which among the following statements is incorrect on MS-DOS? 5).Which of the following is not a usual file extension in DOS? 6).Which among the following is not a part of a standard office suit? 7).Which word is used to describe the act of correcting something? 8).The formulas in Excel are made up of? 9).How many action button are there in PowerPoint? 10). __________ voucher is used to make the entry of sales return?